The following is taken from an internal Disney report that blames Solo's poor box office on the marketing. I normally don't publish stories like these but this is a pretty interesting look at Disney's post-mortem. The soft box office performance of Solo has occasioned some concern that audiences may be suffering from Star Wars fatigue. We think this is probably not the case, and that Solo's biggest problem was an uncharacteristically (for Disney) poor marketing campaign. We rate Disney shares Market Perform. Disney Needed To Sell Ehrenreich as Solo, but didn't. 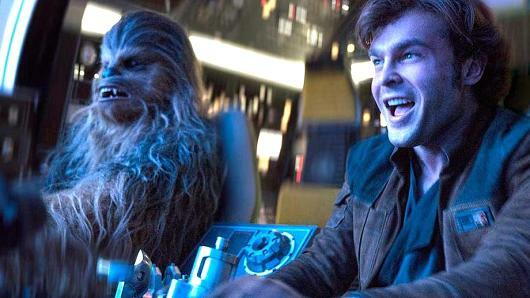 Solo has earned $149MM in domestic box office to-date, including a 65% w/w drop in its second weekend. If we had to guess, we would say the movie is probably on its way to around $200MM in ultimate DBO, which would be by far the lowest for any Star Wars film to-date - on an inflation-adjusted basis, less than half of the next-lowest film (Attack of the Clones at $476MM). International box office is running at about 75% of domestic, and while Star Wars has never been a huge outperformer internationally, this would also be the lowest ratio of any of of the post-OT films (with Rogue One at just under a 1.0 ratio). Many stories have been written about how Solo will likely be the first Star Wars film to lose money, and with the price tag of the movie reported to be $250MM+ due to significant reshoots, it may well finish in the red. Star Wars fatigue. With The Last Jedi having come out just five months ago, some have speculated that Solo was too soon of a follow-up. If this were the case, though, one would think Marvel would be having even bigger problems, with four Marvel-branded films having come out in the last six months (Thor: Ragnarok, Black Panther, Avengers: Infinity War, and Deadpool 2). Clearly, that hasn't been the case. Disappointment with Last Jedi. While Last Jedi received critical acclaim (91% Rotten Tomatoes rating), it received a mixed reaction from audiences, as some thought it was too much of a revisionist take on Star Wars. However, if the franchise was able to survive Phantom Menace and Attack of the Clones, we have a hard time believing Last Jedi could have done that much damage. Worries About Production Problems. Some reports have focused on the changeover in directors and extensive reshoots that Solo went through. However, while widely reported in the trade press, this is still very much an 'inside baseball' thing that we think audiences at large were only dimly aware of. The final product was not amazing, but also not Phantom Menace-levels of bad, getting a 71% RT rating. We think the movie's biggest problem was its marketing. To illustrate, here is the original teaser trailer for Rogue One. It came out 247 days before the movie's release, starting an extensive hype campaign for the film. The first 35 seconds of the trailer almost exclusively focuses on Felicity Jones as the protagonist Jyn Erso, selling her as a new franchise hero. The second half is dominated by the Imperial alert klaxon and Forest Whitaker's voice over, and practically screams 'EPIC' at the viewer, before closing on another hero shot of Jones. Now contrast that to the original teaser trailer for Solo, which came out just 108 days before the movie, offering a far shorter hype window. Disney's marketing department, in our opinion, had one job: sell audiences on Alden Ehrenreich as Han Solo (who we thought did a creditable job in the movie with very tough shoes to fill). The teaser, by our count, only had about 10 seconds of screen time where Ehrenreich's face was clearly in the picture - not, in our opinion, nearly enough. In general, we felt like the Solo marketing campaign didn't get fully up to speed until about a month before the movie came out, and that is simply too short of a window for a big franchise picture.